Americans Neil Armstrong and Buzz Aldrin, on July 20, 1969, at 20:18 UTC. on July 21 at 02:56 UTC. Time: A Law of Nature that prevents everything from happening at once. Rare DX on HF: This is when some Amateur Radio Operators attempt to defy this Law. or even outside the hecatonicosachoron. You may need to refresh the page to get the latest report. Update: Curiosity landed safely on Mars at 05:14 UTC on August 6, 2012. 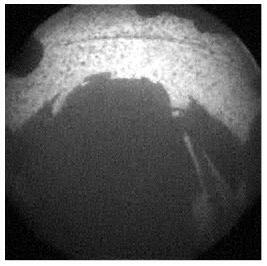 The first photo sent by the rover showing its shadow on the surface of Mars. We all know what that means, there will be six more weeks of Martian Winter. The latest photos taken by Curiosity ... [ PHOTOS ] ... can be found here.